Today I have something unfinished to show you. What's that? When do I every show you anything finished? Well, yes, you're right! So nothing new today then. Me and wonderful mum went to a class to work with porcelain clay and make a 2-tier cake stand. We've taken a class with Katie Almond, the class tutor, before and loved it, so had no hesitation signing up for this one. I absolutely love Katie's style and you should go and check that link out, even if you have no interest in pottery, it's inspiring for many other crafts. Above is a sideways picture (it's round, why did I feel the need to turn my phone round??) of the bottom tier of my cake stand. I think it's the top. I used some acrylic stamps which came free with a magazine to stamp the dress-maker's form, the Singer and the tape measures. I then coloured them with glazes. The light blue patch on the right hand side is where I rolled a piece of lace into the clay to make a nice texture. I'm hoping the glaze on that area comes out very pale, I'm kind of wishing I hadn't painted it now. I made all the buttons round the outside and in the middle and had the idea of making them spotty or stripy as well as solid coloured when I realised how hard it was to paint the sides! 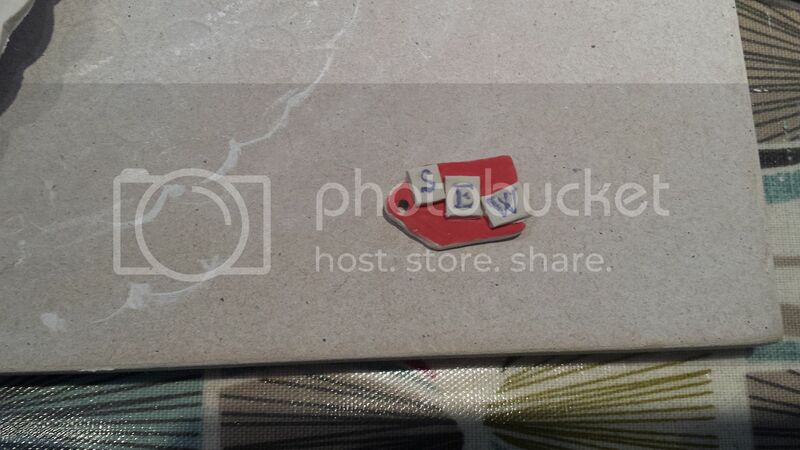 I cut out a small tag shape and some stamped letters which I very carefully painted with a very thin paintbrush. I have no idea how this will come out! Here we have the top. Possibly. The blue lines are where I impressed an open zip into the clay. I only painted the tape, leaving the teeth unpainted. 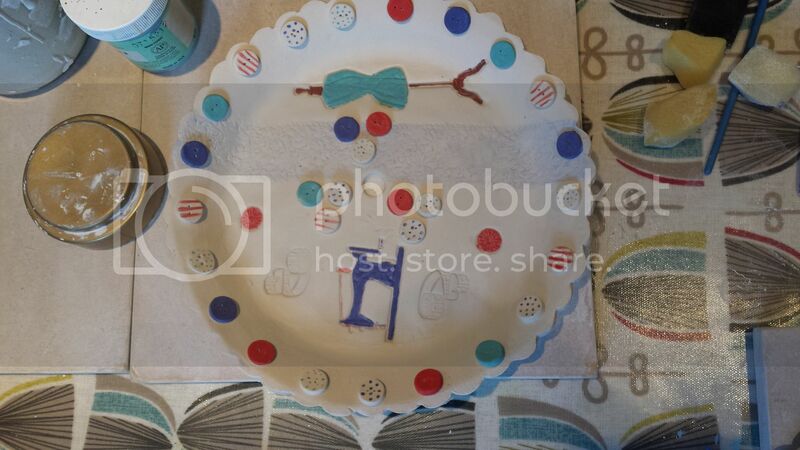 At the bottom is a button jar and some stamped buttons, along with the handmade buttons that I've glazed. I got the idea of doing the mini bunting from another girl in the class, she was doing big bunting for her tea party themed plates. I hope it comes out well - it certainly looks as though it should. Have you seen Cathy Daniel's patchwork-inspired ceramics? You've been taking some very interesting classes. 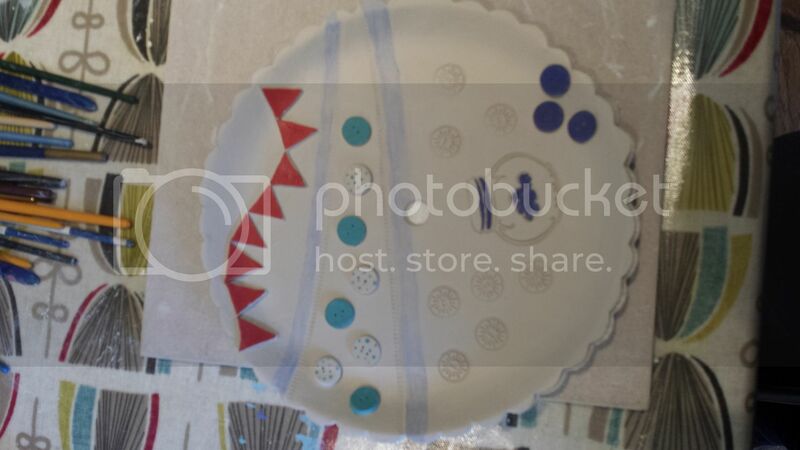 I love that you decorated your plate with sewing related items. It looks great. I'm looking forward to seeing the finished piece.